Home » Articles » Why Do Cats Lick Their Coats? You may have seen your cat licking his or her fur – perhaps on the belly or the legs. In this article we’ll look at why cats do this. Cats are equipped with all the tools they need to keep themselves clean. Your cat’s tongue is part of this equipment. A cat’s tongue is barbed – if you’ve ever been licked by a cat you’ll know how rough his or her tongue is. This allows them to remove dirt, as well as dead and loose hair. Cats pay particular attention to staying clean and licking their coat is part of this process. That’s why an adult indoor cat will spend, on average, 30% of its waking time licking his or her coat. If your cat is a particularly attentive groomer you may find furballs become a problem. This can particularly be the case in longer haired breeds. 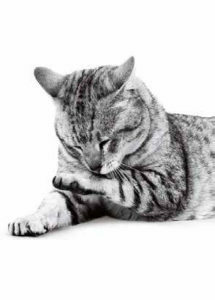 If you’d like to know more about how to help your cat deal with this problem, read our article – How to Prevent Hairballs in Cats. We hope this answered your question about why cats lick their coats. However, if you have another question about grooming, cat cleanliness, or any other questions about felines then we’d like to help. Submit your question below.